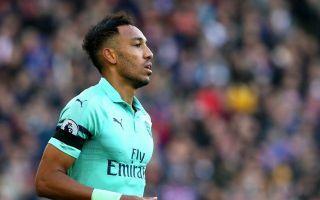 Arsenal ace Pierre-Emerick Aubameyang and Chelsea star Olivier Giroud have publicly slammed those responsible for recent racism incidents in the sport. While it can undoubtedly be argued that the issue has never been eradicated from football at all, it has unfortunately reared its ugly head in recent weeks with a spate of incidents. From the incident at Stamford Bridge involving Raheem Sterling to the treatment of the England players in Montenegro, that was followed by a video of a small group of Chelsea fans singing vile abuse directed at Mohamed Salah before another video emerged of an Arsenal fan directing a racist slur at Napoli defender Kalidou Koulibaly. While the limited view would suggest that this is racism in football, it is bigger than that. This is racism in society, for those who believe that it is acceptable to use such language, taunts and racist suggestions while at a game or otherwise. It simply can’t be accepted and more must be done to get these people out of the game, and that’s the message that the likes of Aubameyang and Giroud tried to get across on Thursday. “I’m really disappointed about this because I had the same problem here against Tottenham,” Aubameyang is quoted as saying by The Sun, prior to the incident involving the Arsenal fan going viral. Meanwhile, Giroud added: “I think these people shouldn’t belong to Chelsea. As noted by talkSPORT, Chelsea acted swiftly to deny those responsible for the abuse aimed at Salah entry to the game in Prague, and so if it really is that straight-forward for clubs to identify these people, then hopefully that sets the tone for more to be done inside the stadiums at least. More answers are needed on how to treat the issue on a bigger scale though, as such incidents aren’t acceptable whether they relate to football or not.